Although many of the risks that led to the brutal fourth quarter selloff have not yet been resolved, we remain cautiously optimistic about 2019 as several key economic indicators are still positive and market dislocations like the recent correction often create very attractive buying opportunities. If you were unable to join our webinar about Managing for Absolute Returns in an Uncertain Environment, hosted in partnership with AdvisorPerspectives, you can watch the replay here. If you were unable to join our quarterly teleconference, listen to the replay to hear updates on the Osterweis Strategic Income Fund. 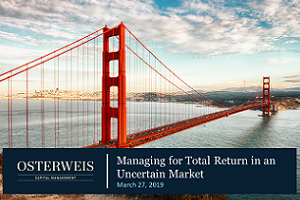 Join John Osterweis at 10 a.m. Pacific, when he will provide updates on the Osterweis Fund and Osterweis Strategic Investment Fund. Barron’s interviewed Jim Callinan to get his thoughts on the small-cap growth segment and some of his favorite stocks. Read about several of the stocks that Jim Callinan, Portfolio Manager for the Osterweis Emerging Opportunity Fund, is invested in, and why he chose them. Advisor Perspectives: Investment Grade – Why Now? Eddy Vataru, lead Portfolio Manager for the Total Return Fund, was recently interviewed by Advisor Perspectives. Carl Kaufman Discusses How the Osterweis Strategic Income Fund has continued to thrive in today’s challenging fixed income market. In 1983, John Osterweis founded Osterweis Capital Management to manage assets for individuals, families, endowments and institutions. Now entering our fourth decade, we are an integrated firm with over fifty employees, managing $6.7 billion in assets. 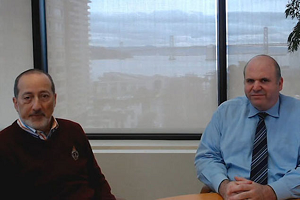 Our clients, many of them with us for decades, know we’ve gotten here through an unwavering commitment to one purpose : To protect and grow our clients’ capital for the enduring security of multiple generations. Criteria for Recommended Funds: Recommended funds are evaluated by Litman Gregory based on a combination of qualitative and quantitative measures, including absolute and relative long-term performance metrics when compared to an appropriate benchmark and peer group, manager skill, investment process and the discipline by which the process is applied, quality and tenure of research team, shareholder orientation, assets under management, and fund expenses. Recommended reflects Litman Gregory’s confidence in a fund’s potential to outperform a relevant benchmark over the long term.